Nepenthes thorelli X trusmadiensis is a hybrid by Exotica Plants between N. thorelii and N. X trusmadiensis (N. lowii x N. macrophylla). Exotica Plants has been putting out some spectacular hybrids involving N. X trusmadiensis lately. 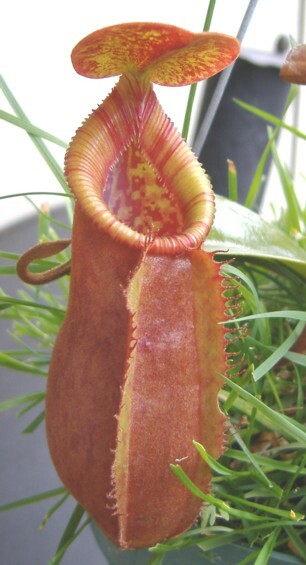 The hope is this hybrid will retain the "toothy" peristome that N. X trusmadiensis is known for. I have several different clones of this hybrid and there does appear to be variation among the plants. Some photos of other growers' plants vary from solid red pitchers to anywhere in between. Peristomes also vary in toothiness and coloration. My plants are smaller compared to some other ones out there. Other growers are growing this hybrid in lowland conditions and it is really taking off. They already have plants that have spiked for them so soon. I think because I grow mine in highland conditions is one reason why my plants have grown more slowly. 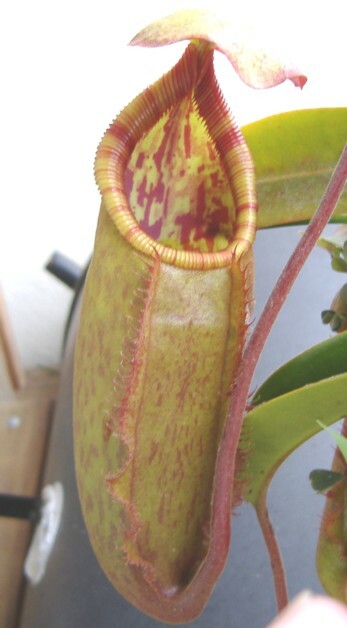 Some of the first photos of another grower's plant had upper pitchers with the curved waistling similar to N. lowii but with a more greener pitcher. There's no doubt that this hybrid is very hardy and vigorous. So far all of the hybrids with N. X trusmadiensis have done well for me outdoors. I've found that the N. thorelii's I'm growing do well outdoors even though I've read that they're lowlanders and that trait seems to crossover to other hybrids using N. thorelii as a parent.